Super easy and quick to make! These will make a lovely ‘friendship’ quilt. In Siblings Together Bee (2), Jenny has asked us to make the blocks from Cloud 9’s Field Crossing Quilt. Another fab boy quilt in the making for Siblings Together camps next year. 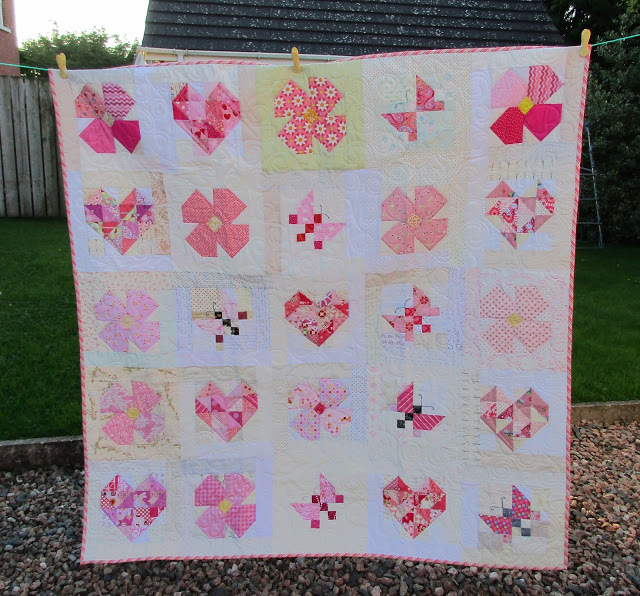 A few months back I made a few ‘girly’ blocks to go into a collaborative quilt for a very special little lady! My special friend, Sarah, had a baby girl in July, and this quilt has been made with love from several of Sarah’s quilting bloggy friends! You can read more about it (& see the cutest baby girl EVER) on Sarah’s blog! Previous Previous post: Absence Makes the Heart Grow Fonder! Next Next post: Easy Baby Blanket!